Pours a nice copper color with amber hues and a fairly rich off white head. The head diminished to a protective film and a ring around the top of the beer fairly quickly but it looks like it will leave some lacing. This is also a highly carbonated beer with lots of tiny bubbles rising up from the bottom of the glass. Nice caramel malts on the nose and with a gentle swirl a pleasant aroma of light flowering hops is released. Wow, that’s an American Oktoberfest. It starts out with that traditional caramel malt sweetness then a nice cleansing effervescence but that’s where it leaves tradition behind because then you are hit with an American hop finish. Not overpowering, there is still a nice malt balance to this beer but a very noticeable dry hop finish. I kind of like it but the purist in me is having a hard time looking at this as an Oktoberfest. It’s more like a fall harvest ESB, not quite hoppy enough for an American IPA. Well let’s see what happens when it warms up a little. Ok, we are now at 63 degrees and this is still a very good tasting beer. It seems to be fewer hops and more malt flavors when it warms up a little. The warmer this beer gets the smoother it gets. Now at 66 it’s turning into one of those beers that I just want to savor it for all I can get out of it. Well all good things must come to an end and so must this brew. The last few sips at 67+ degrees were just fine. This was an impressive beer. I am a sucker for a beer that maintains a good flavor when it reaches room temperature. That type of character just sets some beer apart from some others in my mind. What is more impressive is that this beer is a lager. I had to check it out on their website just to make sure and yes it is a lager. So as impressed as I am with this beer I’m not sure if I’m impressed with it as an Oktoberfest. It just seems too hoppy for an Oktoberfest Marzen. This particular beer is the most difficult one for me to rate. 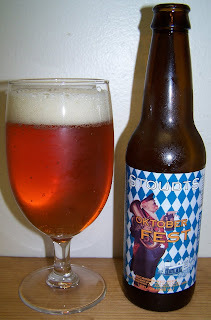 As an Oktoberfest it’s just okay because it is a little too hoppy for the style. As an overall drinkable beer It’s pretty darn good, it holds it’s own and it is very enjoyable. As a amber or red lager It’s excellent, you would be hard pressed to find a lager make in America that tastes as good as this one does at room temperature. So I guess for an overall rating this would be a good to very good beer around a B- or B.
I am probably over thinking this so here is the bottom line. I do recommend this beer to anyone that likes a medium bodied caramel malt beer with a dry hop somewhat bitter finish.